Now as an adult, cutting still happens but the result is usually just people narrowing their eyes at the cutter. Perhaps a few annoyingly loud exhales. Exchanged glances with the others in the room. Eye rolling. The occasional fist fight. Today’s Maximumble is more than you need. In Soviet Russia, line cuts YOU! Damn wizards! Damn wizards using their magic to make terrible puns! My line-fu is strong. Cut in front me me, earn a casual-but-deliberate cripling misstep to your instep. Call me a jerk, but I don’t tolerate jerkishness well. 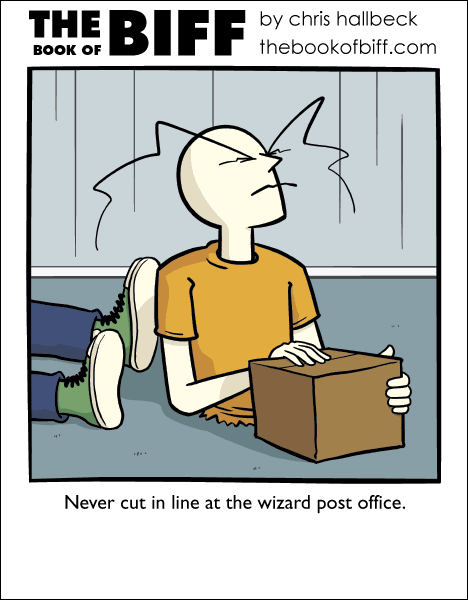 I tend to be apathetic if someone cuts in front of me. Unless they are a jerk, in which case I escalate hostilities. To be fair, a “Hey buddy, the back of the line is THERE,” usually suffices. On topic, is there even a polite way to return a cutter to their proper turn? I liked Harland Ellison’s solution he had in one of his novels. All members in the line immediately forms a court. Hold Trial. Then execute the offender. In real life there was a line I was in that almost resulted in a riot. It was an application line for a high paying job with few openings and LOTS of applicants. Later I realized one of the company reps was watching the line. I don’t think any line-cutter got their application read. Had to post a comment on this elite comic. and today is 1337, not a bad comic to be leet today! I’m loving wizard week, esp. this leet entry. In the third grade, I had a girl quite literally try to strangle me because she thought I was cutting in line. She put her hands around my throat and pressed her thumbs into my windpipe as hard as she could. Biff learns what cutting prices really mean. Bit in half by a really huge owl?